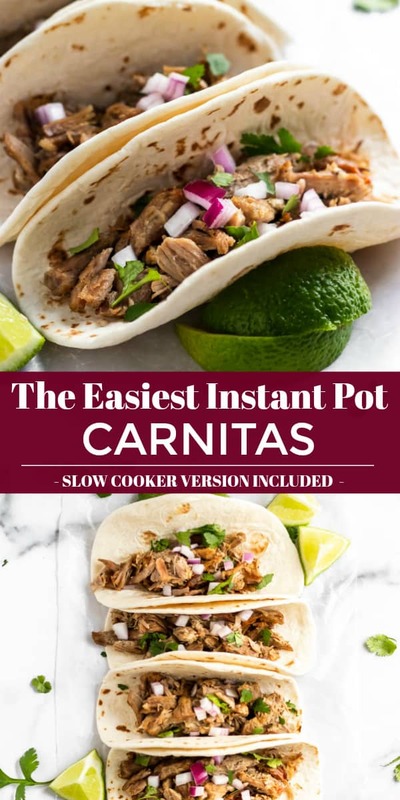 The easiest Instant Pot Carnitas you will ever make! Juicy, tender and crispy and ready in about an hour. Dinner is served and taco night is on! Slow cooker option included in recipe! It’s official, I am in LOVE with my Instant Pot. It only took about a week to realize I never want to live without it. It’s that good. 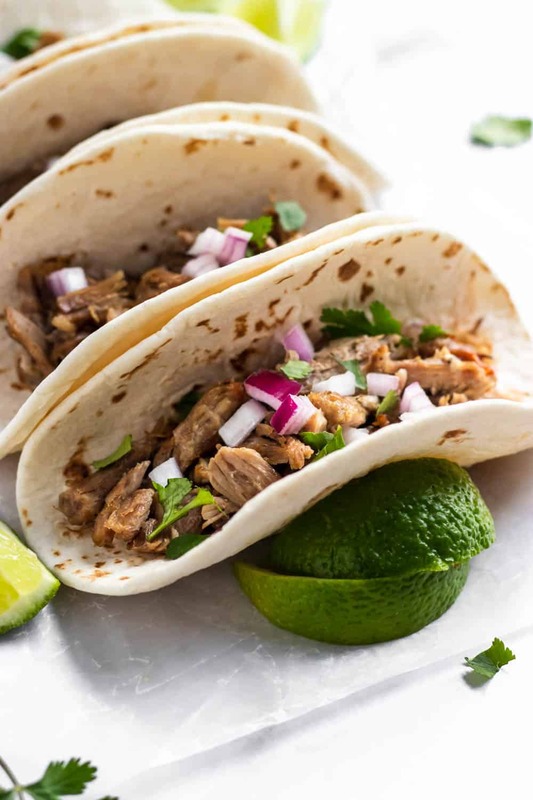 And these Carnitas are another reason why I love it all the more. I get super super boring when it comes to dinner as I have mentioned before. I also get into ruts and make the same thing over and over and overrrrrr. Chicken. Chicken. Tacos. Chicken again. Breakfast–you get the hint. It gets old so I am working on shaking things up more often. Sometimes, something as simple as dabbling in a different type of meat can make a world of a difference. Anthony is really not a big fan of pork so I very rarely make it. But I decided pork tacos had to be the way to his heart if anything was gonna hook him. Boy oh boy was I RIGHT on point with this one. I will be the first one to say that Carnitas need to be slow cooked. I would argue that there is no other way to do it. They come out so tender and juicy and full of flavor. Now that I have made them in the pressure cooker, I am here to confirm that there are indeed TWO ways these can be cooked. Instant Pot or Slow Cooker? Which do you prefer? 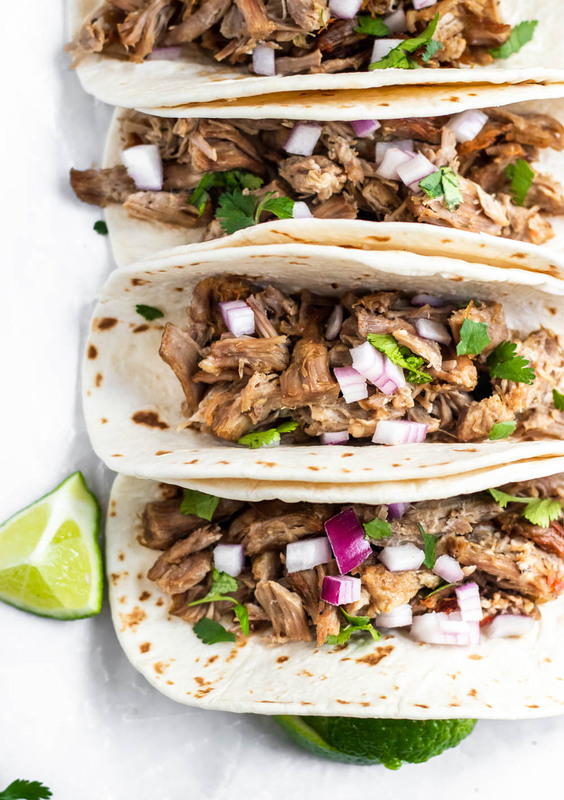 The kicker for the Instant Pot is that you can have juicy carnitas ready in an hour. You read that right, one hour. I know, I know, it’s not like the 5 minute mac and cheese we whipped up in the Instant Pot last week. An hour seems like an eternity when it comes to pressure cooking, but for a recipe like this, it still takes a bit of time. But if you don’t have all day then this is your other option–unless hitting up a restaurant is an option. 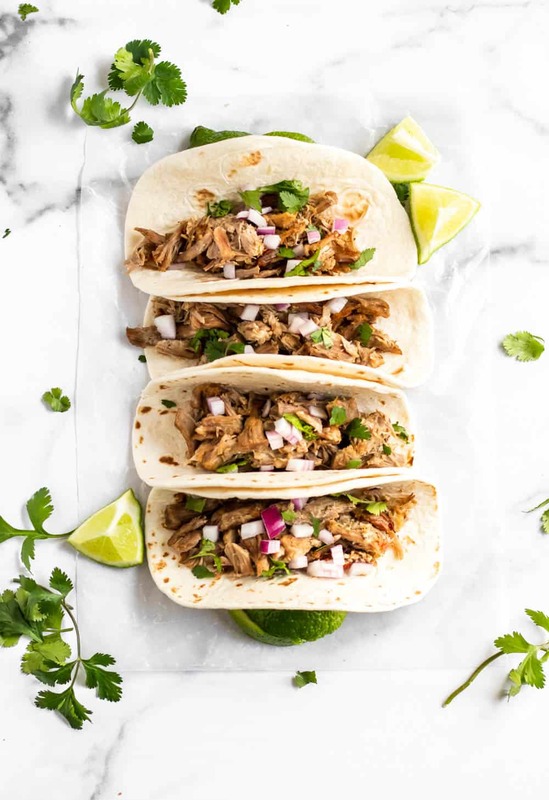 By the way, did I mention that these Instant Pot Carnitas are super duper easy with a capital E?! Oh yea, they are easy as pie, but even easier than that. Toss everything in the pressure cooker or the slow cooker and walk away until it’s time to shred. Confession: I have read hundreds of recipes that have told me to sear my meat before slow cooking or Instant Potting (I have decided that is a word), but I always skip it. One more step I don’t always have the time to do. And I haven’t had any issues. So that is why these are so so simple. No searing, no sautéing, just toss and go! In my honest opinion, the secret to the BEST CARNITAS EVER is broiling them just before serving so they are nice and crispy. So where I said juicy and tender, I really meant juicy, CRISPY and tender. And yes, they can be all of that all at once. Promise. Since I know a lot of you do not use a pressure cooker, I didn’t want you to be left out. 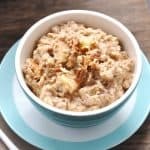 This recipe can 100% be made in the slow cooker as well and I have the directions for both options included in today’s recipe. Now everyone can enjoy these–whether they cook up all day or in a flash. The real question though is, what are your favorite toppings??? Tell me! I love to get creative with this as well. I am a girl who says as long as there is a LOT of cilantro then I am very happy. I ind that broiling the meat before serving is amazing, but this is completely optional. If it’s one more thing to do or you don’t have time for it, these will still taste AMAZING! Leftovers! I think these are better the second day. You can freeze leftovers as well for a super quick dinner when you need something fast. Pork shoulder seems to be the best cut for this recipe. If you are pressure cooking, you will want to cut the meat into 2-3 inch pieces. If you are slow cooking, feel free to leave it in one big piece, but you can still cut it into large chunks if preferred! Instant Pot: Cut pork into about 3 inch chunks, removing excess fat, Pour chicken broth into inner pot and add pork. Add garlic, spices and juices and stir to mix well. Shut Instant Pot, lock and move steam release to Sealing. Set to pressure cook for 45 minutes. After 45 minutes, allow for about a 5 minute natural release, and then quick release the remaining pressure. Remove meat and shred (it will fall apart easily!). For crispy carnitas, layer evenly on a baking sheet and set the oven to broil. Broil for about 5-7 minutes or until desired crispiness. 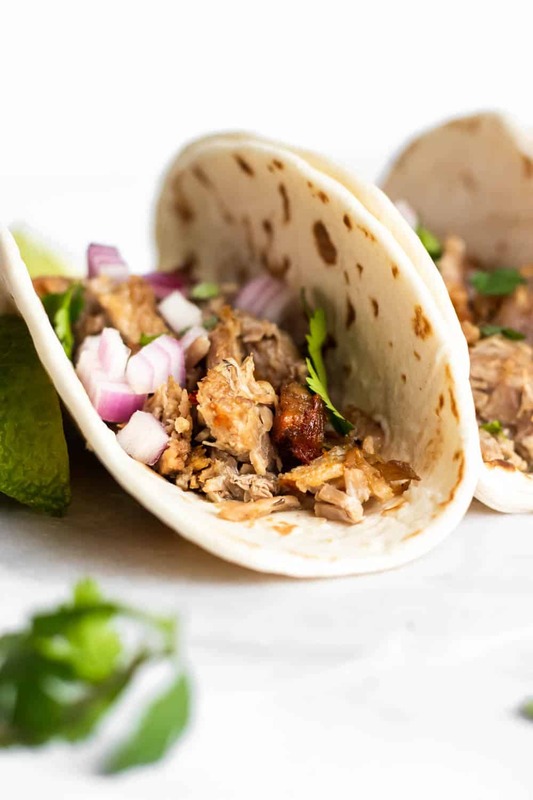 Top with plenty of freshly chopped cilantro and add your favorite toppings to your tacos! Slow Cooker: Pour chicken broth into bottom of crock pot. Add garlic, spices and juices to cover meat. Close Slow cooker and cook on high for 4-5 hours and low for 6-8. Before serving, shred pork and broil as well for 5-7 minutes if desired. Store leftovers in a sealed container in the freezer or refrigerator. 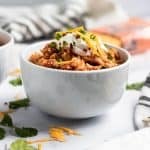 I don’t have an Instant Pot, so the slow cooker variation is great for me. What a fun and delicious meal to enjoy with the family on the weekend. Perfect for entertaining with too. I’m still a huuuuge fan of my slow cooker. Use it just as much for sure. Oh yes! These carnitas are looking incredible! They would make a perfect snack for any friends or family gatherings! Also, your photos are making my mouth water! Very well done! Awwww thank you so much Ana! Ha, I get it. I held off for a loooooong time. But I love it. I have to hop on this Instant Pot bandwagon! 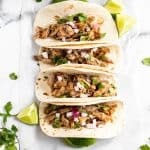 These tacos so look so quick and easy!! I refused for a long time. I should have done it sooner! I know—why did I wait so long?! The slow cooker version is still just as amazing! Enjoy! Everybody loves their instant pot! We are among the few that do not own one, but we are thinking of getting one and make delicious dishes like this! I held off for a loooooong time. Now I can’t inagine life without it! I have a pork shoulder in the freezer. Carnitas are always awesome, but they take so long. Looking forward to trying this IP version. Thanks! Exactly. Sometimes you just don’t have all day! Carnitas are the best! Another instant pot win! Such a great recipe! 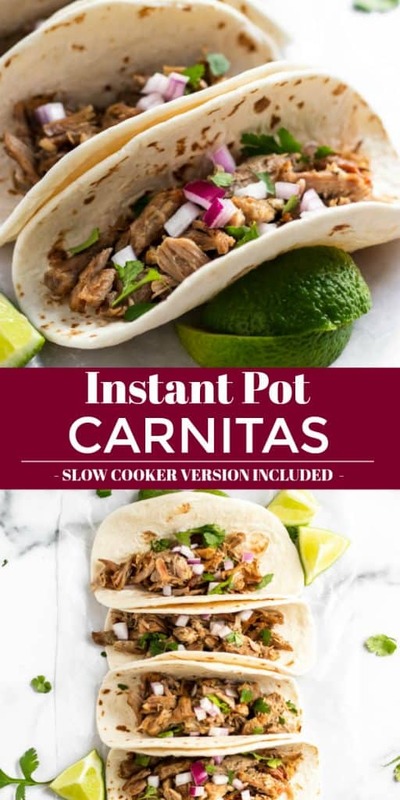 I have got to try your Instant Pot Carnita recipe! Easy and delicious! Great weeknight meal! So so easy!!! Bonus right?! I am a huge instant pot fan, cooking in IP is not just easy and fast but it’s so convenient too. Carnitas are my absolute favorite. Love your pics and saving this recipe to try with chicken later. Thanks Jo!! Chicken will be amazing as well!